Restrepo chronicles the deployment of a platoon of US soldiers in Afghanistan's Korengal Valley. The movie focuses on a remote 15-man outpost, “Restrepo,” named after a platoon medic who was killed in action. It was considered one of the most dangerous postings in the U.S. military. Restrepo follows a US platoon into the Korengal Valley - a location considered to be one of the most dangerous places in Afghanistan. Over the course of 15 months filmmakers, Tim Hetherington and Sebastian Junger (author of The Perfect Storm), lived with the unit and shadowed their every move. As a result, Restrepo features some truly extraordinary footage. The soldiers are tasked with protecting the Korengal Valley against a barrage of attacks every day. They manage to move further into ‘enemy’ territory and establish a new outpost. They call this outpost Restrepo after a popular member of their platoon (Juan ‘Doc’ Restrepo) who was killed at the beginning of their time in the Korengal. However, despite its location, Restrepo isn’t concerned with the rights or wrongs of the Afghanistan war. On my DVD cover, Hetherington and Junger explain that their “intention was to capture the experience of combat, boredom and fear through the eyes of the soldiers themselves... Their experiences are important to understand, regardless of one’s political beliefs”. Restrepo is a truly incredible film. It is tough, tense and upsetting. However, it also feels so important to watch. I was left shaken and heartbroken for all of the people involved. For this is a film that is interested in humans and how they experience war. Each soldier comes across as a person - scared and brave, professional and frustrated, desperate and hopeful. When they suffer loss they are told to mourn for a short time and then move on. They are encouraged to use the anger that they feel following the deaths of their colleagues to fight back. You see the incredible high they feel when they do, but also wonder about the impact this will have on them when they return home. 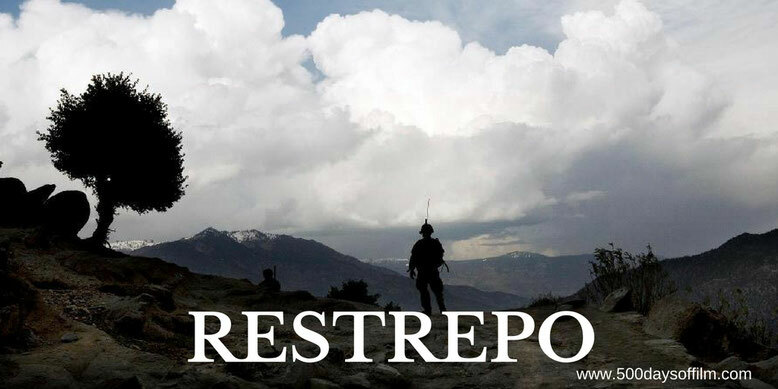 Restrepo is a film that attacks your senses. You feel the danger and the dust of the valley and you also see how beautiful the location can be when the fighting stops. The sound during the gun battles is breathtaking. The sound is real, the fighting is real - the loss is all too real. I bought Restrepo on DVD and on the back cover it describes the film as being “as close as it gets to seeing what life as a soldier is really like”. I don’t know if that is true and I am just so thankful for that. Have you seen Restrepo? If you have, what do you think of this documentary? Let me know in the comments section below or via Facebook or Twitter (you can find me at @500DaysOfFilm).